These aren't exactly the sexiest or most exciting bits of kit you'll ever buy, but they sure are very handy. Good value. Simple to set up and use. Convenient and compact. Don't cover kick or overhead mics. These chrome-plated steel Mic Holders have more in common with regular drum hardware than your typical mic clip. The AMHHH hi-hat mount in action. Investing in your own set of mics is no guarantee as mics require stands and, oddly enough, these tend to be in short supply as well. A solution to such mic provision strife comes in the form of BR Distribution's Mic Holders. Launched at this year's NAMM, Mic Holders is a range of clamps that make a low cost and highly-portable alternative to full size mic stands. While many drum mic sets now come with clip-on holders, all too often these can be flimsy affairs. 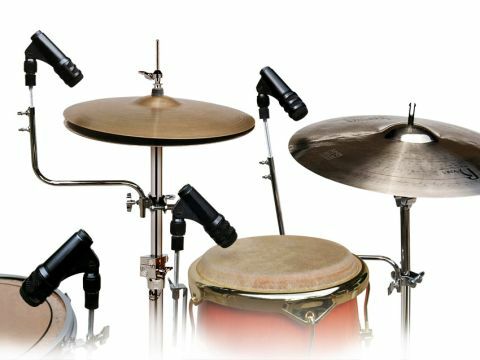 Mic Holders have more in common with regular drum hardware; made from chrome-plated steel, they resemble the sort of mini stands and clamps used to mount splashes and percussive effects. The four models that are available so far are Tom/Snare, Conga, Hi-hat and Cymbal/Snare. All of the mounts clamp securely into place. The Tom/Snare and Conga models feature brackets that slot into the tension rod assembly of the drum. Tightening down the rod locks each bracket - they have been designed to stay permanently attached to the drum. The Hi-hat and Cymbal/Snare models are bigger and have more components. Clamping onto the central tube of either the hi-hat or snare stand, they reach out from under and then above the instruments courtesy of a pair of deft right angles. Each mount culminates in a standard 16mm thread ready to fit a mic clip. Sandwiched between this threaded crown and the tubing of the mount is a rubber dampener to soak up vibrations from the drum or cymbal. Fitting the Mic Holders was simplicity itself. Although the Tom/Snare model required a tension rod to be removed and then refitted, this was accomplished in a few minutes (a Tight Screw tension rod is included in the package). The larger mounts offered more flexibility in positioning, with a fair degree of adjustment achievable to ensure the mics didn't intrude into the playing area. Though a little more restricted, the simpler Tom/Snare mount still offered enough movement to place the mic comfortably. Once in place, nothing wandered over the course of a gig and packing them up at the end of the night was as swift as the initial set-up. At some point you'll probably have to consider buying a set of mics for your drums. Whether you are freelance or a member of a band it makes sense to take responsibility for this important area of your sound. On top of all the gear that you are already carting around, a set of full length mic stands is hardly desirable. Mic Holders are compact, practical and affordable. While they don't cover every kit component (you'll still need overhead and bass drum mic stands) the sheer bulk and cost that they save makes them a thoroughly worthwhile investment.